Between Friday evening January 19 and Tuesday 23 January the Dutch village of Montfort was shelled or bombed on seven occasions, and was hit by more than 100 bombs. Most of these fell in the centre of the village. Nearly all of the 250 houses were damaged. Some houses were no more than ruins, and complete families were killed. During these bombing raids the Germans took shelter in the cellars among the civilians, and in the wooded areas just outside the village. The bombing raids that struck Montfort on the 21st and 22nd were carried out by the Royal Canadian Air Force (RCAF) 2nd Tactical Air Force - No. 83 Group - 143rd Wing. This Wing consisted of 438 (No. 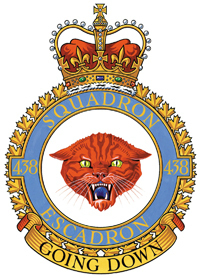 438 Squadron RCAF), 439 and 440 Squadron, and was based at Eindhoven. 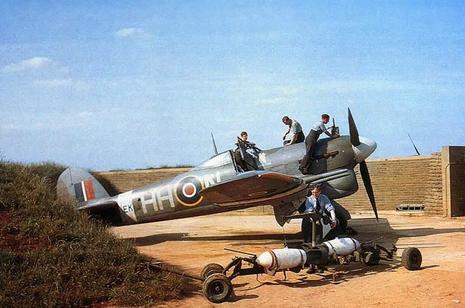 The squadrons were equipped with the Hawker Typhoon 1B fighter bomber. RCAF 143rd Wing lost six aircraft during Operation Blackcock, two of these crashed in Montfort. When Montfort was finally liberated by the "Desert Rats" on January 24 the civilians were in a deep state of shock. The bombing raids on Montfort cost the lives of 186 civilians, most of them buried under their destroyed homes. Gradually, the Germans withdrew to the Roer, covering their retreat with machine gun nests and mines, but by the end of January 'Operation Blackcock' was deemed a success. The Division then held the ground it had taken, with the main activity being 1st Commando Brigade carrying out a number of raids across the Maas. 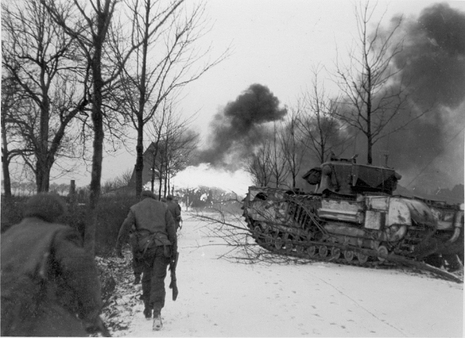 At this time the rest of the Allied Armies were preparing to cross the Rhine and thus 7th Armoured Division was pulled out of the line, on 21st February, and sent for training for the crossing.